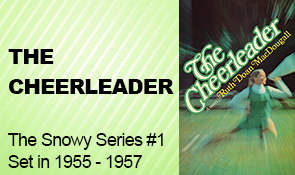 In 1998, on the 25th anniversary of the publication of this national best-seller, The Cheerleader was rereleased as a trade paperback. This rereleased version is now in its fifth printing and an e-book version as well, in both iBook and Kindle formats. The second, third and fourth printings of this rereleased version include a foreword by Ann V. Norton of St. Anselm College. The following volume in the Snowy Series, Snowy, continues the story, and the subsequent five titles carry the stories through more than a half-century of changes in American society during which the characters in these stories shape their lives in various ways. The Snowy Series now includes seven titles, with storylines ranging from the mid-1950s through the first decade of the twenty-first century. Ruth has prepared a discussion guide for The Cheerleader, with an additional section to jumpstart discussions of the sequels included as well. The guide is free and may be downloaded from the link above. It's in PDF format. You may make copies for your group so long as you keep the copyright statements that are part of the booklet. Please click on the image to download the booklet. THE DANCE HAD begun. The gym was darkened now, and sawdust-wax had been sprinkled on the floor, but the smell of hot sweat from the basketball game still lingered. Down the darkness echoed record-player music. Henrietta Snow, known as Snowy, stood with another of the JV cheerleaders in the doorway. She was fifteen years old. She wore dungarees and her white cheerleading blouse, its collar turned up and its starch softened, and she wore her long dark-blond hair brushed into a ponytail that looked like an upside-down question mark. She said, "How disgusting!" But Jean Pond, who was known as Puddles and also known for saying out loud what everyone else was thinking, said, "Maybe we should've been bawling in there, too. Maybe it's our last game, too." Snowy felt sharply sick. "Shut up," she said. "Please shut up." She glanced at her left hand, where today's date had been stamped by the boy at the desk outside the gym. March 4, the stamp said clearly. Soon it would begin to smudge. March 4, 1955. The JV cheerleaders had changed out of their uniforms during the Varsity game. They couldn't take showers; the visiting basketball team was using the girls' locker room, and they changed in the girls' gym office and clogged their sweat with Cashmere Bouquet talcum powder. So they had no real excuse for being in the gym office again after the Varsity game, but sensing drama, they all had wandered back. They were rewarded. The last basketball game of the year, and the Varsity cheerleaders were weeping, hugging each other, sobbing. There were six seniors on the Varsity squad; they wept for the end of glory. And the two juniors, who would be Varsity cheerleaders again next year and probably co-captains, wept partly for the end of this squad but mostly because they were expected to. The JV's sympathized, and the JV captain, a senior, burst into tears, and so did the twin who was very emotional. The gym office was a little room jammed with megaphones, lockers, the gym teachers' desks, square-dancing records, basketballs, volleyballs, and a bulletin board of game schedules, clippings, and jokes. A full-length mirror reflected the clinging group of girls, the Varsity in short green jumpers, the JV's in their dungarees and white blouses, Snowy standing wide-eyed watching. Love you all the time." "Well," Snowy said, and she and Puddles strolled casually over to the bleachers, but they didn't sit down because this would make them seem too obviously waiting for somebody to ask them to dance. They stood half-turned from the dance floor, as if they didn't care, as if they were on the brink of dashing off to something far more exciting. There was, however, nothing in their world more exciting than this. The gym, in the basement of the main school building, was a sunken place, deeper than the basement classrooms surrounding it on three sides. The indoor windows high above were observation posts where kids out in the corridor would lean to watch gym classes or cheerleaders practicing or games or dances. A deep dark-brown sunken place. But to Snowy, it was where love might find her. © 1974, 1999, 2011 by Ruth Doan MacDougall; all rights reserved .